Retirement 2.0: Istvan Gall. The Sun Worshiper. I bought this book at Massolit, a branch of the famous Krakow bookstore. I picked it up because the cover looked interesting and it only cost 1200 forint, or a little over $4.00. 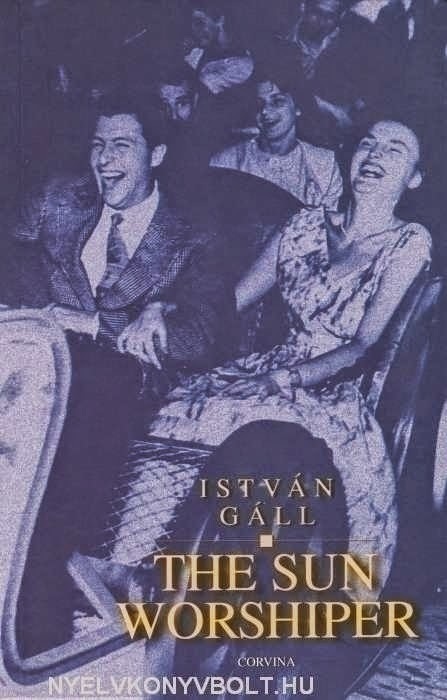 The Sun Worshiper [sic] was written by Istvan Gall, another Hungarian artist who has since seemingly disappeared into what John Batki (writing of Erno Szep) calls the "'black hole' of his nation's collective conscience and memory." It was published in 1970, translated into English in 1985, then republished by Corvina Books in 1999. Gall, about whom little appears on the internet, has a brief Hungarian Wikipedia entry which gives his dates (1931 to 1982) a list of his works, and his awards, including the very prestigious Jozsef Atilla and Kossuth prizes. The Sun Worshiper is a short novel that, on one plane takes place during a single night, but on another across the whole lives of a middle-ages married couple. Robi, the husband, is awakened by the sound of his wife Juli grinding her teeth. He brings her out of a recurring dream about "Germans with dogs." To soothe her, Robi gets into bed with Juli. Juli is happy to "snuggle up to him": she loves the closeness of their bodies. But Robi likes to sleep alone, and he lies there "rigidly with all the discomfort of her body entwined around him." Robi is worried that if he does not get enough sleep, he will be tired the next day and "his work will be shot." Juli is happy to be close to him: "every part of her body was happy." During the night, Robi and Juli talk of their lives. They also doze and dream and remember. His story is of a Hungarian youth who is drafted into the army at the very end of the war and who runs away to survive. Hers is of a Jewish girl who is partially sheltered by a Red Cross hospital. Their stories also encompass their identities within the Communist party after World War II, and their various political and personal struggles. It is often difficult to tell exactly what time period they are thinking about, as the various parts of their past blur into one another and into the present. The novel's original title is A napimado. Napi means daily or diurnal or quotidian. In Hungarian, napimado also refers to sun-loving flowers, such as zinnias or asters. In this sense, Robi and Juli worship the sun as the source of the daily, diurnal, quotidian lives they lead. Much of the novel's force rests in these details: the daily events and experiences that give Juli and Robi's lives their meaning and significance. "Their greatest pleasure is walking. They never tire of it. They fool around while they are walking. It doesn't matter what they say. They only walk for the sake of the rhythm, the same way marching soldiers sing. Julie holds tightly on this arm. After 5:00 everyone is in a hurry. The pedestrians zigg-zagg, the street cars are packed, the cars try to pass each other flashing their blinkers, the city is nervous. For them it was the calmest hour. They promenade, watch the people and the shops." It is the day, the time of the sun, that is the source of happiness. Juli begins every morning asking "will this be a good day?" It is at night that dreams come: of Germans and dogs. At the end of the novel, the jumble of the past becomes the jumble of the daily life: "the twenty thousand eggs that we have eaten sizzle in a largish skillet. . . . Juli makes the radio roar, her hands are covered with grease." It is in this jumble that love resides. The Sun Worshiper is another Hungarian novel in which I don't recognize the Budapest in which it is set. It suggests a different city, made in a different time, that is only partially available to people like me (and like so many other non-Hungarians) who do not speak the language or know very much about the country's history. Like other Hungarin novels I have read, the life of the book lies in the realist prose and the lyrical irony. It is a book where you are never sure exactly where you are: in history or in meaning.